Craft knife with additional ribbon insertion tool. Pink rubber handle for easy use. Ideal tool to cut fondant and gum paste shapes free hand or with use of a template. Works well using scallop acrylic template set. Tip- Hold blade upright, not on an angle for precision cutting. This amazing 2 disc set is perfect for those who want to learn to decorate or for those who need some inspiration. This DVD set is step-by-step visual instructions showing you over 70 designs of different flowers and ideas, all using a simple cookie cutter! With over 3&1/2 hours of learning fun. It goes hand in hand with our cupcake starter kit, covering 14 different shape cookie cutters and the multitude of designs and variations that each cutter can make. It is one of a kind and will aid any beginner in learning, any intermediate to further their ideas and techniques and any professional to inspire and excite! Cymbidium Orchid Flower. Set of 3. Size 2.4×5.5cm / 2.8×5.5cm / 4×5.2cm Create this beautiful orchid using gumpaste/sugarpaste or even modelling clays. Stainless Steel. Safety edge. Made In China. Image of flower accessed via google. Sizes 3-4cm. Set of 9 assorted Easter shapes. Great for use with fondant, gum paste, cupcake or cake toppers and modelling clays to make buttons, trinkets or make mini cookies and shortbread shapes. Cute little shapes. Limited Edition. Embosser Fa La La La. 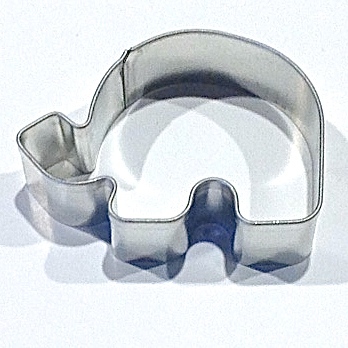 Embosser text area 6×5.5cm, suiting a multitude of cookie cutter sizes and shapes. Overall diameter 7cm of embosser plate. Kate from @Say It With Sweetness has made a limited quantity of cute Christmas embossers just for you! 4 designs to choose from! See other listings. Santa’s Little Helper, FaLaLaLa, Believe in the Magic, Forget the apples, my teacher’s a Peach!